Currently out of stock. Will ship once available. The abstract design and pierced details of this small Christmas Natalia Angel decor let you add a classic touch to your interior with a slightly modern twist. 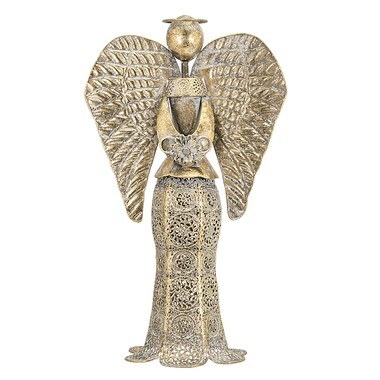 Crafted in 100% iron, this angel decor is just the right size for establishing a nice focal point for your holiday-themed living room. Its flat circular base allows for easy and secure display on tables and shelves. The decor's antiqued Gold finish completes its traditional, vintage look.